We landed at the airport early in the morning and then headed to the resort to check in, park the car, store carryons. First stop was Publix. Its a grocery store not far from our resort. We got some water, some snacks, bananas, and a few toiletries that we couldn’t bring on the plane. We were there about 15 minutes tops! Drove to the resort & parked. I didnt know where our room would be so we just parked near the lobby. As we walked inside, I saw how bright and cute it was. I was so excited to finally be at Disney World!!! We did the online check-in, so we were able to go through that line when we arrived. It was much shorter than the normal line!! We waited maybe 1 minute before we were helped. We asked if there were ANY rooms available. It was only about 8:20am, so I didnt expect there would be – but doesn’t hurt to ask. Alas, no rooms. But she did test our magicbands – they were not working, so that was good. She got us all set and told us that we had a room very close to the lobby right across from the pool. Since the room was not ready, I asked to be moved to a quieter location. She called someone and told us that we would be in a much quieter location, 4th floor of Buidling 4. Ok, perfect! 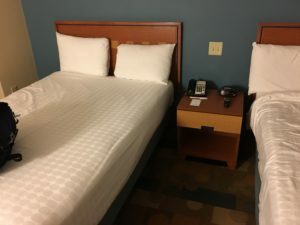 We ran to the restroom, cleaned up a bit, changed out of our airport clothes, and rearranged things so that we only had the things we needed for the parks with us. The rest was stuffed into our carryons, and then stored with Bell services. That didn’t take long at all. There was no line. Now time to go find the bus to Animal Kingdom. We were in line for the bus at about 8:50am. Didn’t make it on the first bus, so had to wait for the next one. It came about 10 minutes later. The park opened early that day, but we had fast passes to do, so we were not too worried. Our first fast pass was for the Safari at 10am. We got to the park about 9:45. We walked slowly through the park, taking in all the beauty and got to the Safari just as our fast pass window opened. Rode it and loved it! Saw lots of animals up and about. Our next fast pass was for Expedition Everest at 11. We had a few minutes to wait so we walked slow, took a ton of photos and got to the ride about 5 minutes before our time – they let us ride. Awesome as ever! I love this ride! Believe it or not, we traveled from California and its a 3 hour timechange – but we didnt really feel it. To us, it was almost lunchtime, and guess what – it was 11:20 – so yes, almost lunchtime. I think the red-eye and the little nap we took helped us battle the loss of the 3 hours just fine! We were tired, yes, but so excited to be there! We ultimately decided to eat at Yak & Yeti. It was hot out and their sign said air conditioned – that’s all it took! LOL We shared some chicken lettuce wraps and some chicken friend rice. It was perfect! Drank a bunch of water and we were off to buy our Express Transportation passes and head over to Hollywood Studios. We bought the passes right there at the kiosk. The cast member had an ipad, she took payment and that was that. The pass would be connected to our park hoppers on our Magic Bands. Awesome! The Animal Kingdom Express Transportation bus stop is near Tuskers and the Dawa Bar. There is a nice shady area where we waited. But we didn’t have to wait long for the cast member to come over and eascort us to our bus. Literally like a 5 minute wait, and we were on the Express Transportation bus. There was a total of 8 people on the bus. Not bad! 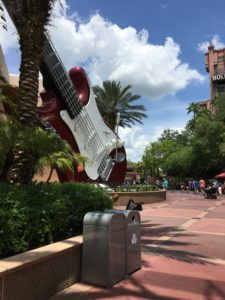 The bus lets you off right near Rock N Roller Coaster. We did not have fast passes for it, so we hopped in the single rider line. Waited maybe 20 minutes. Wow, I love that ride!!! Tower of Terror had a 50 minute wait and we were not up to standing in a long line so we wandered around. We wanted to see how long the line for Toy Story Mania was, but we got turned around a bit, and ended up back by where the stunt show use to be. It was super hot and humid and to be honest, we were done with this park at that point. I would have loved to ride Toy Story Mania, but instead we got some water and rested. You can ask any place that sells fountain drinks for free cups of water. We did that often! Saves a few bucks vs. bottled water. We didnt get to the bus fast enough, so we had about 30 minutes to wait for the next one. Thats ok, we got a margarita, sat on a bench in the shade and people watched. We took some more photos, relaxed, and before we knew it – it was time to head to Epcot. We got to Epcot about 2:45. I love Epcot. I love the atmosphere and just everything about this park. There is so much to see and do! Right now is the Flower and Garden Festival. There are so many gorgeous flowers and plants everywhere! They had some adorable topiaries, too! Everything was just bright and beautiful and it all smelled wonderful. They had the butterfly tent, which was spent a bit of time in. We only had one fast pass for today, so we mostly wandered around and just took in the sights and smells .. and tastes! Of course we also took a bunch of photos! 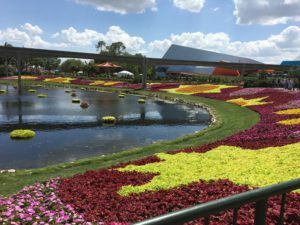 Flower and Garden Festival – gorgeous flowers everywhere! We stopped at a few of the pop up outdoor kitchens for some snacks. Watermelon salad – delicious! Frushi – delicious! Margaritas and smoothies – delicious! You could spend all day eating and drinking and never get to try it all. Our Fast Pass for Soarin’ came up so we wandered over there. Its the same movie as at Disney’s California Adventure, but we still loved it. As we were leaving I saw Sunshine Seasons. A friend told me I had to try their carrot cake cupcake – so we did! It was actually quite yummy! Not too sweet. It was moist and tasty! It was nice to sit for a few minutes and gather ourselves and come up for the plan for the rest of the evening. By the time we were done here it was time to head over to Magic Kingdom. First we changed our clothes. It felt good to clean up a bit and put on fresh clothing. Off to the Express Transportation Bus for ride number 3 – to park #4. The buses are large, normal buses with A/C. We never had more than 8 people on one bus. So there was always room to spread out. We arrived at Magic Kingdom. The bus lets you off right in Tomorrowland at Buzz Lightyear. We were so excited to see the castle, so we walked that way. Its breathtaking! I love that castle – makes Disneyland’s seem so small. Dont get me wrong, I love the castle at Disneyland, but its definitely a smaller castle! 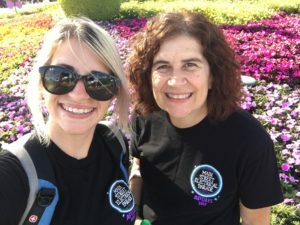 We both wore our Disneyland AP shirts – they have the Electrical Parade photo on them – we got lots of comments on our shirts. They were suppose to glow in the dark, but I don’t think they did. 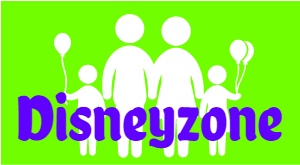 My daughter did the Disney College Program about 9 years ago, she worked in Fantasyland. She was so excited to be back in her ‘home’. We took lots of pictures and then headed over to our dinner spot. We had reservations at Jungle Navigation Skipper Canteen at 7:30. We got over there about 20 minutes early. We asked if we could be seated early and the guy said yes. He showed us to a little room where we could wait.. and wait.. and wait. 7:30 came and went. Finally about 7:50 they called our name. We were hot, tired, and a little hangry by then. Why tell someone they’d be seated early, when in reality it would probably be 20 minutes later than expected. 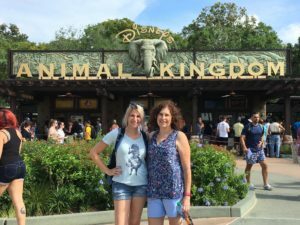 We could have wandered around and enjoyed soaking up more Disney… OH well. So we were not in a great mood and this could be why we didn’t enjoy this meal very much. The menu, I must admit that I did NOT look at it before hand, was not appealing to either of us. We were not hungry for a large meal, we really just wanted to get a couple appetizers. Nothing sounded great. We ordered a cold noodle salad and the shrimp & pork dumplings. They were ok. Nothing to write home about. We ate about 1/2 of each thing. Heard the desserts were amazing, so we ordered dessert. We got the Kungaloosh which was this gooey cake thing with ice cream on top. It definitely was the highlight of the meal. I just dont think this place is worth the hype. Yes, we were going to 2 hours of sleep, yes, we had been to 4 parks in one day, yes we walked over 23000 steps, and we were hot.. we had to wait a long time for our table.. I think we were just done! But now its time for Wishes!!! This is the reason for this trip and we couldn’t be more excited. The sugar from the dessert has pumped up our energy level and we couldn’t wait. We watched from my daughter’s ‘snow ropes’ – which are now called the east ropes. Anyway, we were behind the castle. Its an immersive spot to watch the fireworks – they go off from all directions! We loved it. We both teared up a little. 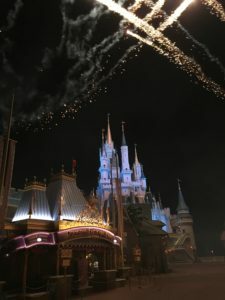 It is sad that Wishes is leaving, but it had a good LONG run!!! We waited for the all clear to go back through the castle. We wandered down Main Street. I remembered about the Sorcerer of Magic Kingdom game – so we stopped in the Fire Station to get our map and cards. We will play next time we come.We are both exhausted and really just want to get to the room and get to bed. Now for my next stupid mistake. My mind was exhausted at this point. For some reason I thought the bus stops were at the TTC – so we headed over to the monorails – super long lines but no line at the resort boats. Ok, lets take a boat over to the Polynesian then hop on the monorail. Sounded like a great idea at the time. It was actually a nice boat ride. The skipper had a hard time parking, he had to back up 3 times and try again. Poor guy, he was getting frustrated. None of us really cared, we just waited for him to figure it out. We got off and wandered around the Polynesian a bit, then hopped on the monorail. Got to the TTC and realized that the buses were back in front of the Magic Kingdom. Yikes! We were just so pooped at that point – I called an uber. The guy was there in 3 minutes! $15 and about 15 minutes later we were back at the hotel. It was surge pricing, but still was worth it to me! Really we were DONE! We got back to the hotel, stopped at the bar so my daughter could get a drink. I didnt need a drink, I was ready to pass out! It was a gorgeous night out. That’s one thing I enjoy in Florida, the evenings are so nice. You can walk/sit outside and not be freezing! I wish I had a little more life in me, I would have liked to explore around the resort a bit. But I really needed sleep!